Image 1 of 40. Click to view fullscreen. 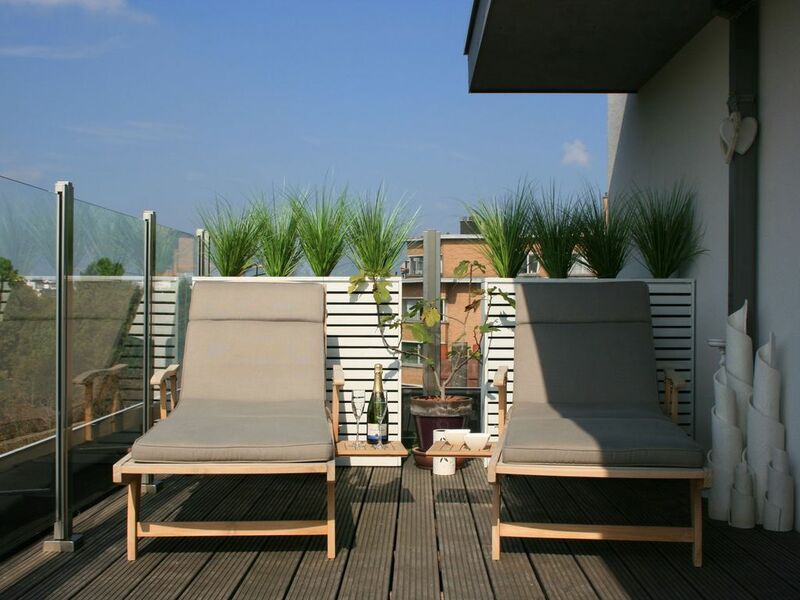 This fabulous penthouse is located in the centre of Ghent. The interior boasts a very luxurious and tasteful design. The penthouse is encircled by multiple terraces, which provide a wonderful view of the city centre. You can spend hours enjoying the view of Koning Albert Park from the great lounger on the terrace. In the evening you can admire the beautifully illuminated architecture of Saint Peter's Abbey as you savour a good glass of wine. From the penthouse you are incredibly close to everything. Most of the sights are within a radius of 500 metres. Nice attractions include Saint Bavo Cathedral (where you will find the famous Ghent Altarpiece), Gravensteen or one of the many other castles, the Blaarmeersen recreational area where you can enjoy water sports on warm days, the vibrant Oude Dokken area where people like to meet up and lots of activities are organised, the Glass Alley (Ghent's red light district), the famous Belfry, the historic Graslei and Korenlei wharves with their stately guildhalls, and much more. Easy excursions from here include a trip to the lovely city of Bruges or a day at the beach. When exceeding the free Wi-Fi-5 GB your guarantee will use &gt; with 6 €/GB be deducted. My wife and I took our four kids on adventure to Belgium. We spent two nights in Casa Monica in August 2018. The condo is amazing. This is luxury hotel living! The condo has large windows everywhere with magnificent views. The patio is simply majestic. Casa Monica is very clean and well appointed. We were very close to the old city; just a short walk away. A supermarket, bread shop, and butcher were around the corner making cooking in the great kitchen very easy. The parking garage in the building was very helpful for our easy in and out trips around the area. We all wish we had stayed at Casa Monica longer. Corinne, the owner, was so friendly and helpful. We would love to return to Ghent. If we do, we will definitely stay at Casa Monica. We give this condo our highest recommendation!! Ghent is a beautiful city with many interesting museums, galleries and sites of historic interest. We thoroughly enjoyed our stay there. This very comfortable, well-equipped property is located only a short walk from the city centre and made an ideal base to explore the city. The roof top terraces give great views over the city and despite being on a main road are not at all noisy. A very delightful place to stay. Ghent is a great spot for a city break. We were met and cordially welcomed by the owner who was meticulous in showing us round. The penthouse has every facility required for a self catering holiday. We really enjoyed using the convenient tram into and across town and didn't use the car for the whole of our stay. Happily the car was safely parked in the subterranean garage which was a real bonus. We purchased a Ghent City card which gives you transport on the trams and buses, entrance into the galleries, museums and a boat ride. 35 Euros for 3 days is very good value, highly recommended. We enjoyed sitting on the wrap around terrace on sunny evenings. As the double beds are not large we used both double bedrooms to ensure an undisturbed night's sleep. A unique property with much to offer those who prefer the freedom of self catering to a hotel room. Monica apartment (penthouse) together with its great view , perfect decoration combining elegancy , comfort and warmness in great harmony is just a masterpiece. A stunning apartment with fabulous terraces overlooking the treetops. Lovely hosts who were only a phone call away if we had any questions. Unfortunately the weather was a little disappointing which meant we couldn't get the full benefit of the terraces for 3 of the days we were there. Nonetheless we would highly recommend this apartment and Ghent itself.